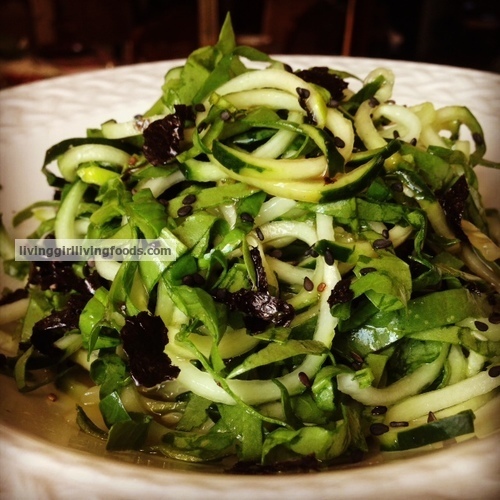 For the most part, I think people who have been reading, following or eating raw vegan recipes for a while are bored with zucchini noodles. At first there is a lot of hype and excitement over it, and then it’s over hahaha. At times raw zucchini can be rather difficult for some people to digest. It can create discomfort, possibly a burning sensation or diarrhea. Cucumber noodles are much more easier on the digestive process and provide more of that wet slurp noodle fun. To create noodles the best gadget is a spiral slicer, there are other attachments also to play around with more noodle shapes. Cucumber noodles are mostly made of water so it can be surprisingly filling. Usually depending where one lives, cucumbers can always be found and they aren’t too expensive. Below I will share two cucumber noodle creations I have made that myself and others have enjoyed. These took at most 8 minutes to prepare and probably only costed around $5 to make per serving. Besides a spiral slicer I did need a blender for one of the sauces. This might sound loco to some, but I like to challenge myself in the kitchen with trying to use less and make more. Less gadgets, ingredients, techniques, nuts, oils and so forth. 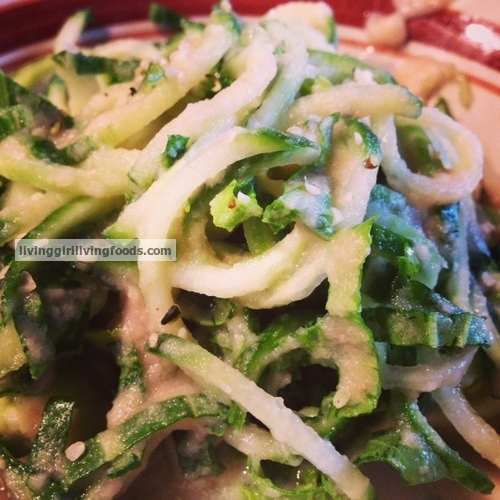 Any who, here are some yummy cucumber noodle dishes I have come up with! Light sprinkle of black sesame seeds to tie it all up! Some other great add ins for these that just aren’t really my things personally would be; garlic, onion, scallions, dates or coconut nectar for sweetness, peppers, snap peas or anything you come up with! These are just some basic ideas for you all to launch off and make it into your own yummy creation.